We cannot recommend Squarespace highly enough for entrepreneurs who are building their own site. Not only is it incredibly user-friendly, it’s completely possible to design an entire site without the headache of coding (but hey, if that's you're thing we've got you covered on that too). The templates offered by Squarespace and our squarekits make it possible for non-designers to have an affordable and professional looking website. If you're struggling to decide on a template to use, read this article first. Once you have your template chosen, you can easily add your own branding and have a customized site in no time. Before we dive in, make sure you’ve uploaded your logo, and customized your colors and fonts to match your branding. 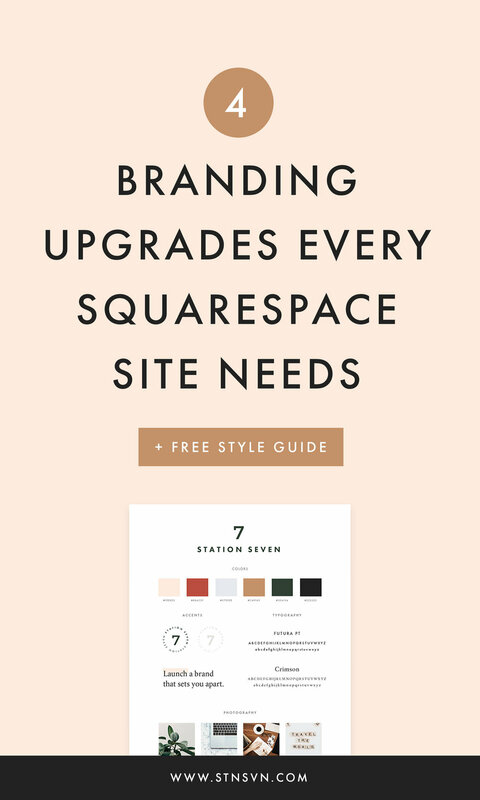 Those are the most obvious ways to apply your branding to your Squarespace site, but it doesn’t end there. Here are a few more things you can do to go above and beyond in creating a branded website. If you’re branding includes a submark or any icons, these are great to add to your site in a few different places. If you’re not familiar with what a submark is, it’s an alternate brand element that visually relates to your logo. Submarks tend to be more simplified than your main logo, making them great to use at a smaller scale. I love to place submarks in the footer of a website. This adds some visual interest and personality to a place that tends to be a little boring. People typically don’t expect much when they scroll to the bottom of a page, so why not surprise them with something fun and memorable? Here’s an example of a submark in the footer of a website. Customizing your favicon is another easy way to add your own branding to your site. Favicons are the small icons that appear in the URL bar next to your web address or in the tab, depending on your browser. Since they're so tiny it’s important that you use something simple. Although it’s tempting to think that something so small isn’t important, favicons are the icing on the cake of a beautiful website and communicate your attention to detail. 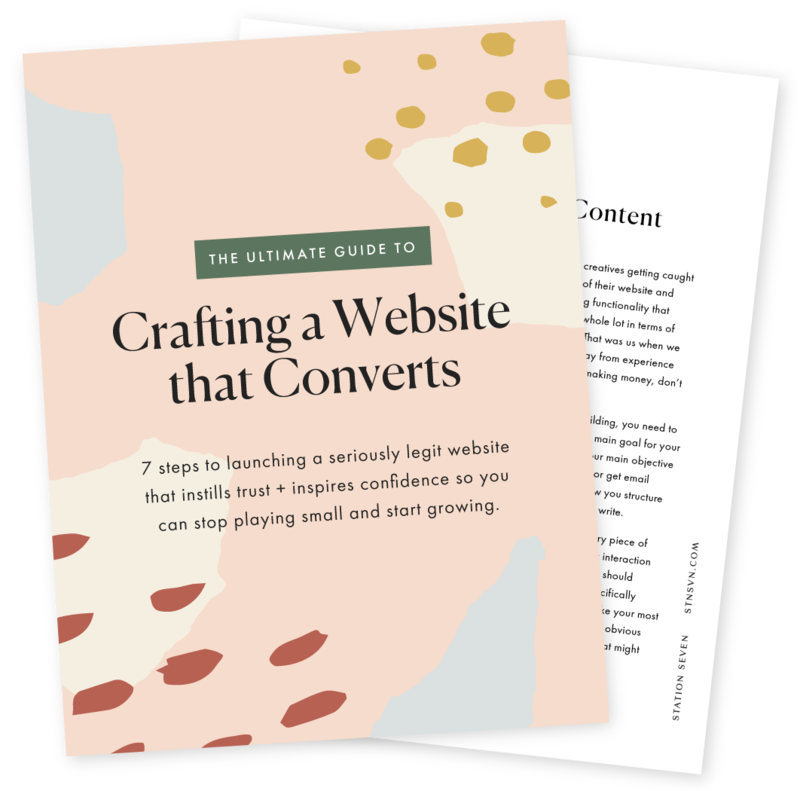 To learn more about the benefits of using one, how to add one to your Squarespace site, and to download free ones check out this article. If you’re branding includes patterns there are a few ways that you can incorporate them into your website. One of the most obvious ways is to use them as banner images. This instantly adds your brand’s personality to each page of your website. It’s one of the first things that people will see and is a great way to make an impression. Another option, and one of my personal favorites, is to use them as the background for buttons. To do this insert an image block, upload your pattern, and link that image to whatever page you would like it to go to. You can set the caption to overlay or overlay onhover, so that people know what the button links to. Here is an example of a pattern in use on a website. If you haven't yet nailed down these brand elements, no worries. Start pulling everything together using our style guide template! You can download it now simply by signing up below. Another great way to add a personal touch to your site is to add an Instagram social block. This will sync with your account and show your most recent posts. If you have a well-curated and on-brand Instagram feed this is a great way to carry that over to your website. It also encourages visitors to follow you by giving them a little preview. To add an Instagram block to your Squarespace site, simply edit the area where you would like to insert it. Click to insert a block and scroll all the way to the bottom where you will find Instagram. Choose the account you would like to connect or add a new account if yours is not already connected, then choose how many images you would like to appear at one time. Lastly, click on the design tab in the upper right corner. This is where you can choose the layout of your feed. As always don’t forget to apply and save your changes! Squarespace has announcement bars that appear at the top of your site. This is something you should take advantage of to point visitors to the landing page for your lead magnet. Because it automatically appears at the top of every page, you can ensure that everyone who comes to your site sees the great offer you have and has the opportunity to opt-in. It’s an easy thing to do and a great way to grow your list. To add one to your site, go to Design > Announcement Bar. Select Enable announcement bar from the drop-down options. Add the text you want to appear in the announcement bar. Choose the page you would like it to link to when people click on it. Then save your changes. To ensure that it's on-brand, customize the color of the bar and the fonts to match your branding. You can make these changes if you go to Design > Style Editor. Scroll all the way down to announcement bar at the very bottom and make your customizations. There you have it! Although Squarespace undoubtedly has great templates, without some customizations it can begin to look a little cookie cutter and your business is anything but. Fortunately, you are now equipped with the knowledge you need to easily apply your own branding to your website. If you haven’t already, check out our Squarespace kits for drool-worthy designs that will take your business to the next level. They also come with step by step video tutorials to walk you through the whole process. You got this! Do you have any secret hacks for upping your Squarespace game? Share with us! We'd love to know how you're making your Squarespace website your own.